The following post by Richard Scrase of UAR discusses a new free e-book (also available as pdf) which Understanding Animal Research (UAR) and Moshe Bushmitz has produced. It’s well worth a download, so please share with friends. These are the questions answered in our new iBook, Primates in Medical Research. Making full use of the iBook’s capability to show video, images and sound, Primates in Medical Research shows the vital role of primates in medical research. The iBook feature recent video clips recorded in primate research and breeding facilities in the UK, US and Israel. Its galleries include over 80 images of primates that illustrate the iBook’s 71 pages, along with archive material and a timeline showing medical advances with primates stretching back a century. 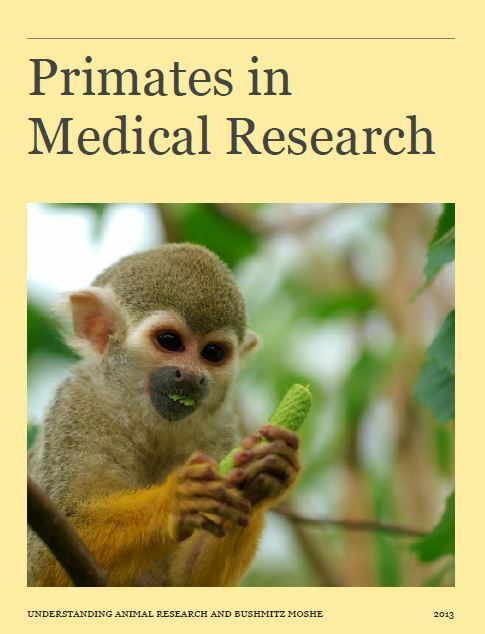 Primates in Medical Research is free to download from iTunes. Currently it can only be viewed on iPads. A PDF version can be downloaded from our website here. Posted on October 4, 2013 September 22, 2014 by EditorPosted in News, Outreach NewsTagged animal research, animal testing, macaque, medical research, monkey experiments, primates.